Has Final Fantasy Versus XIII become Final Fantasy XV? UPDATE: Roen has issued a statement claiming the text on their website was posted in error. 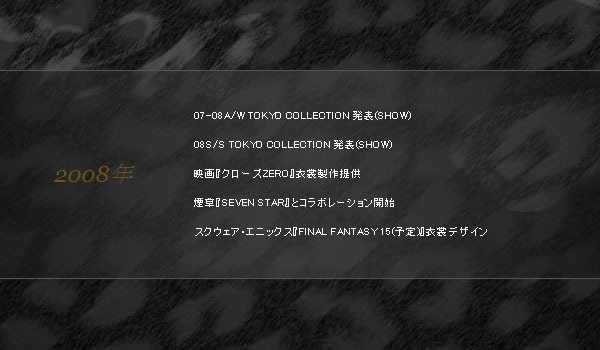 Since then, they’ve corrected the biography listing under 2008 for Square Enix – it now reads “Final Fantasy Versus XIII (Tentative)” Clothing Design. The company apparently held a listing on their site as far back as July 2012 for “Final Fantasy XV” – a tentative title under their credits from 2008 for design work. For some reason it’s only been discovered now and as of this posting is still available on their biography page. Roen has been signed on to produce the clothing for Final Fantasy Versus XIII – the likes of which were completed back in 2008 and showcased at Jump Festa later that year. Whether or not this means anything has yet to be seen, but with Versus XIII absent for over two years and a promise of a new Final Fantasy for PS4 at E3 perhaps the mainline treatment is the only option left for it.